The SEMISTACK water-cooled platforms offer a pre-qualified power assembly ready for integration following rigorous SEMIKRON qualification tests and the latest environmental standards (IEC 60721-3). The platform design has been optimised to achieve the ideal balance between costs and performance for a water-cooled power inverter in the megawatt power range. They are designed for applications requiring a high degree of reliability and long lifetimes of up to 20 years. The design and footprint enables compact integration in standard industrial cabinets, making high power of up to 6MVA low-voltage possible. 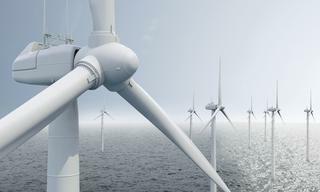 Specified for wind turbine applications, the SEMISTACK family boasts excellent IGBT cycling capability and a high capacitor bank lifetime, reducing maintenance requirements. The SEMISTACK RE platform offers a standard inverter size HWD 1500 x 230 x 510mm to fit two power sub-assemblies into a 600 x 600 x 2000mm cabinet. 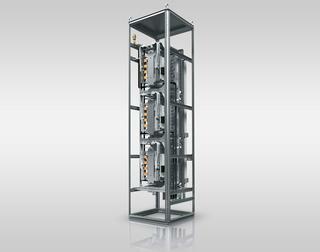 The standard size has a current distribution between 1000A and 1400A. For applications with lower current rating or with a stronger constraint on the cabinet size, a smaller inverter size HWD 1250 x 230 x 510mm offers continuous output current rated from 600A to 900ARMS. The SKiiPRACK platform consists of a cell HWD 525 x 375 x 470mm to be assembled with others cells to create a functional unit in standard cabinets 600mm deep and 2,000mm high. A cell can integrate an H-bridge, a 1-phase leg + brake chopper or 12-pulse rectifier, and combination of them can create 3-phase inverter, 4-quadrant converter or 3-phase rectifier and inverter. The output current range offers scalability from 600A to 1200A continuous. The SEMISTACK platforms comply with wind turbine requirements, making it possible to build 4-quadrant converters that are suitable for use with synchronous generators and double fed induction generators, with an optional brake chopper design. The platform flexibility allows for the requirements of solar central inverters to be met with a continuous DC bus voltage of up to 900VDC. Alternatively, SEMISTACK platforms can be used in low-voltage applications requiring high power and a high degree of reliability, such as 3-phase inverters in a shipyard or in a battery energy storage unit installed close to renewable energy power plants. The SEMISTACK water-cooled platform offers various inverter sizes to fit two power sub-assemblies into a 600 x 600 x 2000mm cabinet. The standard size has a current range between 1000A and 1400ARMS. For applications with lower current ratings or with tighter cabinet size constraints, a smaller inverter size is available with a continuous output current rated for up to 900ARMS. The SEMISTACKs embed the SKiiP IPM product family, which in turn integrates IGBT gate driver and monitoring analogue outputs (temperature, output current and DC bus voltage). As an option, a CAN interface is also available to monitor the SKiiP. 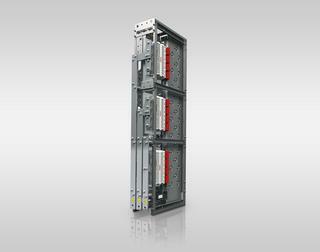 To increase power capacity up to 6MVA, SEMISTACKs can be put in parallel, connected together through the DC bus and controlled all-in-one using a SEMIKRON paralleling board. Optionally, SEMISTACK platforms are also available integrated into an industrial cabinet with suitable AC and/or DC power filters, electrical and hydraulic distribution systems. Sorry, we were unable to find products that match your current set of filters and/or search.